The upkeep of office cubical panels, conference room and desk chairs can be a daunting task. Cleaning these things is so much more cost effective than replacing them. It is sometimes surprising to even me just how dirty they can get. Life is happening in our offices every day. We all often skip breakfast or lunch and then have those meals at our desks. 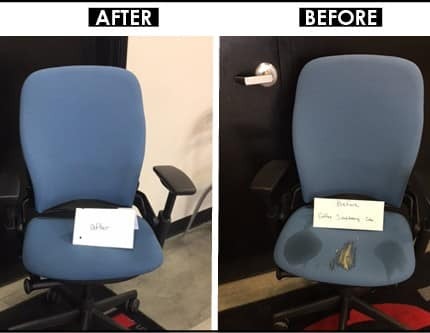 While it does increase productivity, our desk chairs and cubical panels take a beating. The continuous use of conference and meeting room chairs is evident by their appearance. That’s where we come in. We can do a onetime cleaning or design a maintenance program that suits your needs. A maintenance program can lessen the budget impact for a company while still reaching the cleaning goal. Give me a call and we can talk about how our company may be of service to yours.